PROVIDENCE - The Department of Environmental Management announces that test results from one mosquito pool, or sample, from a trap set in Westerly at the edge of Chapman Swamp has been confirmed positive for West Nile Virus (WNV). The positive WNV result was from a Culex species of mosquitoes that bites both birds and mammals. The positive finding came from mosquitoes trapped by DEM staff on September 10th and tested at the RI Department of Health (HEALTH) laboratory. The results were confirmed today. In addition, a sample of mosquitoes also collected on September 10 in North Kingstown near Wickford has tested positive for Highlands J virus. The positive result was from a Culiseta species that bites birds. Highlands J virus is a bird disease that doesn't affect humans, but which is an indicator that environmental conditions are appropriate for the transmission of other mosquito-borne viruses. According to Alan Gettman, Ph.D., DEM's mosquito abatement coordinator, even though evening temperatures have gotten cooler, there are still infected mosquitoes in the environment. Therefore, all Rhode Islanders should take extra care to protect themselves, particularly when mosquito-biting activity is high. Biting activity depends on several conditions. It generally is greatest from dusk to dawn. During the day it decreases in sunny areas at lower temperatures and increases in shady areas at higher temperatures. Biting activity also generally increases with high humidity and with low wind. Personal protection is the first line of defense against mosquitoes that can carry diseases such as West Nile Virus and EEE and is by far the most effective way of avoiding infection. 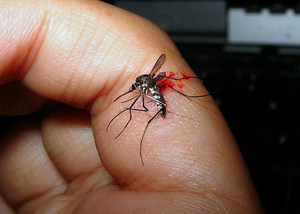 People should routinely use mosquito repellent and cover up when mosquito-biting activity is greatest. They should place mosquito netting over playpens and carriages outside, and be sure that screens are in good repair. Mosquito repellent should contain no more than 30 percent DEET, and it should not be used on infants. Because horses are susceptible to West Nile Virus and EEE, Rhode Island horse owners should consult with their veterinarians to determine if their horses are properly vaccinated against both diseases and take measures to control and prevent mosquito exposure. Those controls should include: removing or covering all areas where standing water can collect; applying mosquito larvicide in appropriate locations; and avoiding turning animals outside at dawn, dusk and during the night when mosquitoes are most active. Horse owners should insect-proof facilities where possible; use approved repellants frequently; monitor animals for symptoms of fever, in-coordination, stumbling and neurological signs; and report all suspicious cases to a veterinarian immediately. This year, to date in Rhode Island, five pools of mosquitoes have tested positive for Eastern Equine Encephalitis and five pools have tested positive for West Nile Virus. Mosquitoes in Rhode Island are trapped every week statewide by DEM staff and tested at the RI Department of Health laboratory. DEM will normally report mosquito test results once a week on a routine basis, with additional reports as necessary. Routine test results from the remaining 116 pools of mosquitoes trapped on September 10th will be included in next week's announcement. For online information about mosquito-borne diseases, go to DEM's website, www.state.dem.ri.gov, and click on "Public Health Updates", or go to the HEALTH website, www.health.ri.gov, and click on "E" (Eastern Equine Encephalitis) or "W" (West Nile Virus) under "Health Topics".